Can other procedures be used at the same time? This is a procedure used to remove the excessive skin and fat that may hang from the under surface of the arm causing the “bat’s wing” condition. This is a procedure used to remove the excessive skin and tissue that may hang from the under -surface of the arm (“bat’s wing” deformity). This may be a result of massive weight loss. The amount to be removed varies with each patient. Loss of sensation may be experienced on either side of the scar on the arm and occasionally small patches of sensory loss may occur on the chest. The technique may employ liposuction, alternatively it may require skin excision only. The incision runs along the inner upper arm with a zigzag extension in to the armpit. The incision will extend to a variable degree on to the side of the chest depending on the amount of excess skin and tissue that is present in this location. The arm is an area where healing is unpredictable. An arm reduction will improve the contour and definition of both the arm, armpit (axilla) as well as the side of the chest. Classically drains are inserted which exit from the elbow and are normally left in place for one to two days. It is possible to combine an arm lift at the same time as surgery to other areas of the body. Please discuss this with Dr Belt at the time of your consultation. These can be broken down into both general and specific risks. The specific risks include bruising, swelling, uneven or asymmetrical results notably rippling, dimpling and loose skin, collections of fluid or blood occurring under the skin. Skin discolouration which is generally temporary but may become permanent. Permanent loss of sensation is unusual though some patients do find that they have some reduced sensation for the first few months following the operation. The fat that has a poor blood supply may result in a discharge from the surgical wounds or palpable lumps. Even following good healing and good surgical results, scars can be unsightly and disappointing. Dr Belt will try to limit the scar length and place the scar in the least obvious location on the arm. The scars may migrate and the final scar placement is unpredictable. The quality of the scar is also unpredictable and keloid or hypertrophic scars may occur. These types of scars are thickened and raised scars that can be itchy as well as unsightly. These include Dr Belt’s fee, a surgical assistant's fee the theatre and hospital fee, as well as a specialist anaesthetist fee. The surgery can be performed as a day patient or as an overnight case. Usually a drain will be placed into the wound which will remain in place for 1 to 2 days. It is possible to go home with the drains in place. In day case procedures, generally the patients go home after a few hours. Most patients report that pain and discomfort are minor for the first few days. Local anaesthetic is still in the wounds and this will give some pain relief for a few hours after the procedure. Paracetamol is usually sufficient pain relief but you will be discharged with some stronger analgesia (pain killers) in case you get breakthrough pain. Plan a very quiet week after the surgery. A dressing and bandage will be provided and this reduces the swelling in the treated areas and should be maintained until you are reviewed in Dr Belt's rooms at the time of drain removal and a dressing change. Most people return to work within a week or two of surgery and light activities can be resumed within two to three weeks but normal activities may take up to six weeks. 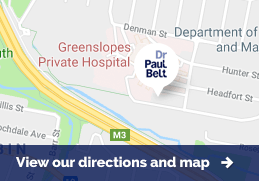 Dr Belt recommends that the surgery is performed under a General Anaesthetic administered by a specialist anaesthetist.